La guerra in Afghanistan è cominciata ufficialmente il 7 ottobre 2001, a meno di due mesi dall'undici settembre. L'undicesimo anniversario è passato sotto silenzio nel nostro paese e altrove, rimosso. Undici anni da un'invasione decisa e perpetrata senza alcun avallo dell'ONU, che però il 20 dicembre seguente, con il paese ormai in mano agli americani, ha autorizzato con una risoluzione l'ISAF, una missione di supporto al governo dell'Afghanistan, che all'epoca non c'era. Ce lo hanno messo gli americani, scegliendo Hamid Karzai come presidente e una serie di banditi e signori della guerra ad assisterlo. Alla missione ISAF il nostro paese partecipa con circa 4.000 uomini e ne ha persi appena una cinquantina. Anche se i morti in guerra non sono mai troppo pochi, il risultato si può considerare eccezionale e in buona parte dovuto da una postura assolutamente difensiva del nostro contingente, che secondo molte fonti alleate è stato protetto anche corrompendo i possibili nemici o chiunque avesse interesse a sparare sui nostri. Una pratica comune a molti contingenti, di sicuro il nostro è stato al coperto, la caccia ai talebani è sempre stata un problema degli americani. Undici anni dopo l'ISAF e gli Stati Uniti hanno superato abbondantemente il periodo dell'occupazione sovietica e progettano un ritiro, parziale, solo nel 2014. I sovietici dopo nove anni sbaraccarono completamente, oggi Washington vorrebbe lasciare in Afghanistan qualche base perenne e un governo sensibile alle sue esigenze, almeno formalmente. Oggi c'è Karzai, che assistito dall'ISAF, dall'ONU e dagli USA governa dopo brogli elettorali clamorosi, denunciati anche dai signori sponsor. Un governo privo di legittimità e corrottissimo, che non ha alcuna base di consenso al di fuori di quello garantito dalla protezione occidentale e che con le sue esibizioni ha rinforzato la popolarità dei talebani, che aspettano che gli stranieri se ne vadano e che forse aspetteranno a lungo, ma che a differenza dei loro avversari hanno fondate speranze positive. Per di più, dato che in undici anni l'Occidente di infrastrutture ne ha costruite poche in Afghanistan, quando il Pakistan ha chiuso il transito dal suo territorio, abbiamo scoperto che far uscire le nostre truppe dal Nord costerebbe un sacco e non si potrebbe fare entro il 2014. Non si è fatto molto in Afghanistan, Roma ad esempio aveva promesso aiuto per mettere insieme codici civili e penali e un sistema giudiziario moderno e ci ha anche investito discrete somme, per nulla. I nostri 4.000 uomini restano là, tristo tributo da vassallo all'impresa americana, ancora più tristo in quanto concesso con generosità da un Berlusconi che delirava da statista cercando gloria e sponde all'ombra di Bush e di Blair, che la storia ci dice si siano comportati da truffatori per trascinare i “volenterosi” in Iraq. In quei tempi molti si spendevano per venderci le guerre e avevano la pessima abitudine di bollare come traditori o “pacifinti” chi poneva obiezioni, persino Amnesty International finì criminalizzata per aver previsto 50.000 morti in Iraq, saranno molte volte tanti alla prova dei fatti. Sarà per questo che l'Afghanistan come l'Iraq è un buco nero per la nostra informazione, nonostante gli anni d'occupazione e di generoso impegno a favore degli afghani, e degli iracheni, avrebbe dovuto produrre documentari e reportage, invece niente. In Afghanistan e in Iraq i giornalisti non stanno bene, sarà quello, ma poi si vede che non fanno notizia neppure le quotidiane stragi che continuano in Iraq o le vittime di guerra che cadono costanti in Afghanistan, scanditi ormai solo dalle agenzie. In effetti si è già spento anche l'interesse per la Siria e ora che si sono zittite le trombe dei guerrafondai, umiliati dal fallimento su tutta la linea della war on terror, ben pochi hanno conservato interesse per la guerra al terrore, che pure ha solo cambiato brand espandendosi a numerosi altri paesi in maniera per nulla ufficiale, ma ugualmente letale. Manca la possibilità di strumentalizzare questi eventi in chiave interna, vista la "responsabile" adesione bipartisan alle due guerre, e non ci sono neppure le orde di potenziali profughi che costrinsero Frattini a sostenere Ben Alì e Gheddafi, preziose barriere contro i terribili migranti, prima di unirsi a chi li ha spazzati via. Una svolta a 180° conclusa con i nostri aerei a bombardare il leader libico pochi giorni dopo che il nostro ministro degli Esteri e il Presidente del Consiglio gli avevano espresso sostegno pubblicamente, un prezioso alleato contro la minaccia islamica e gli abbiamo dovuto sparare. Più di dieci anni di politica estera fallimentare, di decisioni sbagliate persino nel rapporto con gli alleati, sono un motivo più che sufficiente per ignorare le guerre che in qualche maniera continuano a vederci corresponsabili e coprotagonisti, sperando di non doverci risvegliare un giorno e scoprire che all'improvviso che l'Afghanistan si è trasformato in una trappola per i "nostri ragazzi" o anche peggio. Un posto che è conosciuto con il soprannome di "tomba degli imperi", in teoria può sempre riservare qualche spiacevole sorpresa, ancora di più a una classe politica non si è mai distinta per una particolare lungimiranza e che in questi ultimi anni ha coltivato un totale disinteresse per il destino di quella triste missione. The war in Afghanistan started officially on October the 7th 2001, less than two months after 9/11. The eleventh anniversary has gone under silence in our country, while elsewhere it has been removed altogether. Eleven years from the day of an invasion decided and done without any consent from the UN, which however on the 20th of December of the following year, with the country steadily in the hands of the Americans, has authorized with an ISAF resolution, a mission of support to the government of Afghanistan, which at that moment was non existent. The Americans put it there, choosing Hamid Karzai as a president and a series of outlaws and lords of war to help him. 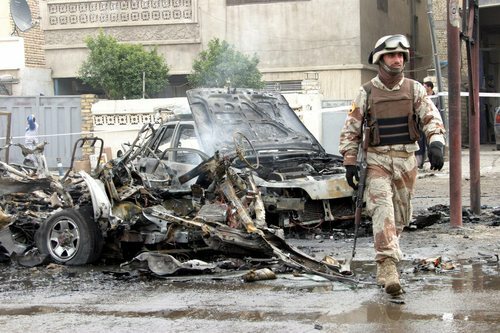 Our country participates with 4.000 men to the ISAF mission and has lost about 50 of them. Even if the dead on the field are never too few, the result can be considered exceptional and mostly attributed to an absolutely defensive position of our troups, which according to many allies sources has been protected by corrupting possible enemies or anyone who had interest to shoot on our men. A common practice in the military, ours has always been safe, chasing Talebans has always been an American's job anyway. Eleven years after the ISAF and the United States have widely overcome the time of Soviet occupation and project to get out, at least partially, only in 2014. The Soviets were out of there completely after 9 years, today Washington would like to leave in Afghanistan at least a few American bases and a government sensitive to its needs, at least formally. Today we have Karzai, who is ruling protected by the ISAF, the UN at the US after evident elections frauds, which have even been communicated by the sponsors. A government which lacs legitimacy and is extremely corrupt, with no base of consent outside the one guaranteed by the western protection and that with its exhibitionism has reinforced the popularity of talebans, which wait for foreigners to leave, and that will probably wait for a long time, but have positive hopes, unlike their enemies. Moreover, given that in eleven years the West has built almost no infrastructures, when Pakistan closed the transit on its territory, we discovered that making our troups exit from the North would be extremely expensive and wouldn't be doable until 2014. There hasn't been much done in Afghanistan, Rome for example had promised help to put together civilian and penal codes and a modern judiciary system, and has also invested quite some money in it, for nothing. Our 4.000 men remain where they are, a sad tribute to the American deed, even sadder since it has been given generously by a Berlusconi who had statesman delirium searching for glory and a place in the shadow of Bush and Blair, which history tells us have behaved as frauds in order to bring the "willing" to Iraq. In those times many went out of their ways to sell us wars and had the awful habit of calling traitors or pacifictions those who posed any objections, and even Amnesty International ended up being criticized because it had estimated the deaths in Iraq at 50.000. They would have been many more. Maybe it is for this reason that Afghanistan, as Iraq, is a black hole for our information, although during the years of occupation and of generous work for Afghani and Iraqi, some documentaries and reports should have been produced, but nothing. In Afghanistan and Iraq journalists don't sit well, maybe that's why, but it is obvious that not even the daily killings are a news anymore, even though they continue to happen, or the war victims that fall constantly in Afghanistan, and are signaled only by agencies. Even the interest for Syria has boiled down and now that the trumpets of war are silent, humiliated on the entire line by the war on terror, very few still have an interest in it, even though it has only changed its brand by expanding to numerous other countries in a manner that is as unofficial as it is lethal. There is no possibility of strumentalizing these events in an internal key, given the responsible bipartisan choice to take part in the two wars, and there are no hords of potential refugees that constrained Frattini to sustain Ben Alì and Gheddafi, precious barriers against the terrible immigrants, before uniting to those who swiped them away. A 180° turn ended with our planes bombarding the Lybian leader a few days after our minister of Foreign affairs and the Premier had expressed public support, a precious ally against the Islamic threat, and we had to shoot him down. More than ten years of failing foreign politics, wrong decisions even in the relationship with allies, are a more than sufficient reason to ignore wars that in some way continue to see us co-responsible and co-protagonists, hoping to not have to wake up one day and discover that Afghanistan has turned into a trap for our men or even worse. A place that is to this day known with the name of "Empire grave" in theory can still have some unpleasant surprise, even more for a political class that has never distinguished itself for a particular capacity of foresight and that during these last few years has cultivated a total disinterest for the destiny of that sad mission.